By olduvai in Energy on August 14, 2018 . The last quarter has seen increased volatility in oil prices, an increase that I attribute to the growing tensions in international markets as fears of a global trade war intensify. The headlines seem to get starker by the day, and markets loathe this type of uncertainty. The intent of this article is to provide some guidance as to where oil prices may be headed in the near term. I think there are some key drivers at play here and will discuss them in some detail in the rest of this article. 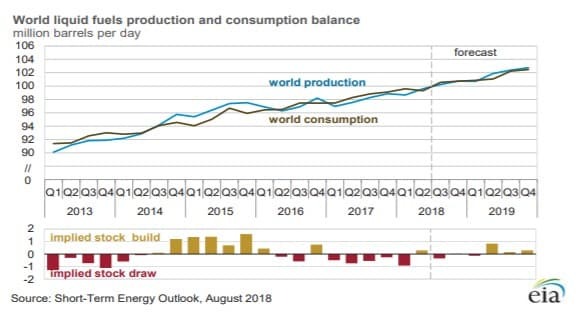 One of the reasons for the big energy depression that hit in mid-2014 was an oversupply caused by Saudi Arabia ramping up production to drive prices down. They had several goals in doing this as has been discussed in countless articles, but chief among them was the desire to take high cost barrels off the market. Their primary targets were the American frac machine in North America, and deepwater production that was grabbing an increasing share of big IOC dollars. This worked fairly well over the short run, as energy producers outside Saudi were unprepared. For most of 2016, the frackers in America retooled their portfolios and improved practices, cutting average well costs down to where they were economic with $40-50-dollar oil. U.S. shale was back in business. The deepwater business is still struggling to regain its momentum. Demand is likely to increase for the foreseeable future though, with an average annual increase of about 1.6mm BOPD for the years covered in the Global Supply and Demand Chart above (2013-2018). The upward slope continues through 2019 at about the same rate of increase.